The extensive yellow underparts and thin bill of our quiz bird look good for one of the wood warblers. The upperparts are unstreaked and the wings are plain and unmarked. Almost all of the Dendroica warblers have streaked upperparts or prominent wingbars, and the few that don't have streaking on the sides or entirely yellow underparts. Note that the undertail coverts of our bird are white. The Oporornis warblers also have entirely yellow underparts, so out they go. Prothonotary Warblers have yellow underparts and white undertail coverts but lack our quiz bird's "spectacles". Of the Vermivora warblers, our quiz bird is most similar to a Nashville. 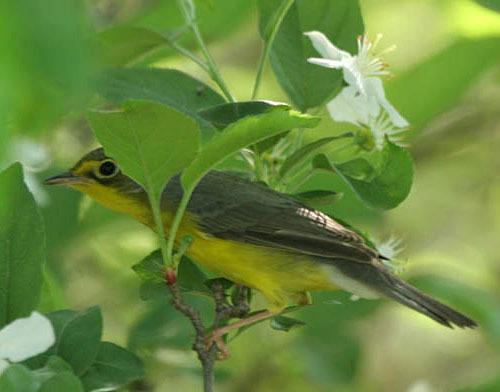 A Nashville Warbler however would lack yellow lores and would have yellow undertail coverts. The spectacles, plain upperparts, yellow underparts, and white undertail coverts really only work for one warbler, and that's Canada Warbler, one of 3 species in the genus Wilsonia. Canada Warblers though are supposed to have breast streaking, right? Well, the breast is obscured by that plant, and the bird appears to be a female so the breast streaking wouldn't be that prominent anyway. This Canada Warbler was photographed by Kanae Hirabayashi on May 28, 2008 at Montrose Point in Chicago.